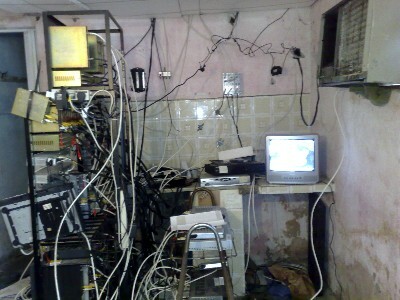 Thre cable TV service run by crimunals in RioÂ´s favelas was much cheaper than its legal successors. Last month the Rio police, supported by marines in armoured cars and a cloud of TV cameras, stormed the Rocinha favela, unopposed by the drug traffickers. Behind the media theatre, the policy of reoccupation seems to be working. Police stations are followed by social services. Tourists and banks are venturing in. Shopkeepers donÂ´t have to pay protection any more. The favela dwellers are delighted to be freed from the rule of mobsters, right? Up to a point, Lord Copper. They now have to pay for their electricity instead of stealing it from the street lighting cables. Tough. They also – and here I have much more sympathy – have to pay a lot more for TV. As air reception is very poor on the steep hillsides, TV was supplied over an illegal cable network, the gatonet, controlled of course by the drug gangs. The going rate was 15-30 reais a month for up to 120 channels, including the free-to-air ones that carry telenovelas and football, and hacked paying film channels. IÂ´m quite impressed by the banditsÂ´ technical achievement here. Favelistas are now being offered the service by legal providers for twice the price: 40 to 80 reais. The minimum wage in Brazil is 543 reais a month, and many favelistas will be living off less. 10% of their income just for TV! The gatonet was provided by murderous outlaw kleptocrats, but their legal Brazilian counterparts are in this area even worse for the poor. My (non-poor) daughter in Lille pays 30 euros a month (72 reais) for 20-megabit ADSL (the slow offer! ), 100 free TV channels and many others at a reasonable a la carte charge, and unlimited phone calls in France. ItÂ´s not I think an accident that there are no low-power repeaters on RioÂ´s many hills to provide decent air TV reception, or that the municipality has not simply taken over the seizedgatonet and run it as a very profitable public service. There are TV satellites over Brazil, but owned by Globo and Sky (from which we buy a poor-value package). The selection of free-to-air channels is very thin. In Europe the TV satellites are owned by Astra, a Luxembourg corporation independent of the TV networks it carries, including SkyÂ´s encrypted ones and FTA ones from the BBC, ITV, and Germany. There must be a profit opportunity in Rocinha for pirate satellite TV using hacked second-hand Sky receivers. Brazil has the typical second-world problem of governance. It seems to lack a professional higher civil service; ministers are free to staff their fiefs with party cronies, which helps explain the high level of corruption and the serial scandals in Brasilia. In state capitals, it doesnÂ´t even become a scandal. A technocracy can be a force for competition if itÂ´s given a mandate. The European Commission is unideologically power-hungry, so itÂ´s super-statist in agriculture (inheriting French policy) and strongly pro-competition in electricity and telecoms (inheriting German policy). ItÂ´s possible for a right-wing party to be pro-competition, if it has a liberal ideology (in the European free-market sense) and a base representing small business, like ThatcherÂ´s Conservatives or the German Free Democrats. If the losing conservative candidate in the last Brazilian general election, Jose Serra, had such a vision, he certainly didnÂ´t articulate it. Which brings me to the Republicans, another party of businessmen. GOP policies clearly only reflect the interests of big monopolistic corporations, not small ones. On credit card fees, the GOP backs the extortionate fees of the Visa and Mastercard duopoly (>2% per sale against 0.5% in Europe) against the interests of retailers, garage owners and Joe the Plumber. It opposed public works in a recession, a lifeline to small construction companies; and ObamaÂ´s moves towards universal health care, an obvious interest of every American employer. How many minutes a week does a Danish employer spend worrying about the health insurance of her employees, and how many staff does she pay to handle it? Zero. Thomas Frank, in his famous WhatÂ´s the matter with Kansas?, noted the Â¨false consciousnessÂ¨ of Republican American workers who vote their cultural biases against their material interests. Does not the same apply to Republican small businessmen? If the conversation about the end of the U.S. Postal Service sounds familiar, it’s not just because we’ve heard variations of it since 1970, when the old Post Office Department became a separate business.Â It’s also because the destruction of mail delivery closely parallels the wrecking of AmericanÂ passenger rail.Â Apparently the Congress has it in for quasi-public institutions with work forces composed disproportionately of African-Americans. Passenger rail has always been a losing proposition; the money is in freight.Â But until the late 20th Century, as the price of using public assets—tracks, switches, signals and the rest—freight railroad companies were required to carry passengers at a loss.Â Then somehow this social compact broke down.Â Both railroads and their regulators started talking as if railroading were an ordinary commercial enterprise instead of a public utility.Â Ordinary for-profits aren’t expected to maintain business lines at a loss.Â Indeed, to the extent they do so, they’re considered incompetent.Â So the people making money from national railroad facilities were able to persuade Congress that they shouldn’t have to bother maintaining passenger service.Â In other words, the railroads figured out how to shift their burden—what had been a simple cost of doing business—to the public.Â Voila: Amtrak. Independent passenger rail was bound to be a financial failure, and it was.Â So year after year after year Congress has complained about Amtrak’s losses and tried to reduce them by shrinking the system until by now it’s small enough to drown in the proverbial bathtub.Â Little-noticed along the way is the fact that many of the jobs being lost belong to black people. The Brotherhood of Sleeping Car Porters was the first black-led union recognized by the AFL, and probably the most powerful union dominated by African-Americans in the United States.Â Â Much of the foundation of the black middle class was laid on the decent wages and benefits and pensions fought for and won by that union.Â So whatever hurts Amtrak—and these days, pretty much everything does—also hurts the African-American community. Now connect the dots to the Postal Service.Â Mail, like rail, is a public utility.Â Â (If you doubt that, take a look at the Constitution, where the Post Office rates a specific mention. )Â A group of companies—the mailing houses and catalog producers—get to use this public utility to make a private profit, and they’re doing very well by that arrangement. Once again, though, the price they were supposed to be paying for this benefit was to subsidize service to individuals.Â So once again, someone re-conceived this public utility as an independent corporation subject only to the iron law of profit and loss.Â Now the profitable commercial service canÂ continue on its merry way while the money-losing public service is forced to resort to the kind of cuts which predict—if they don’t actually cause—an imminent visit to the scrapheap (or bathtub). And once again, an outsized group of the fired employees are African-Americans, because the Post Office was an equal opportunity employer before the phrase had even been coined.Â So right in the middle of the Great Recession another pillar of the black middle class is knocked down. There is an alternative to the current flood of crocodile tears over the death of written communication.Â We could return to the social compact that regarded mail service—and rail service, for that matter—as something to be paid for by the people who benefit from it most.Â That doesn’t mean those of us who receive an occasional Saturday letter, or sometimes take the Metroliner—it means the freight shippers.Â In the case of the Post Office, at least, the public has been subsidizing them instead of the other way around.Â End that particular piece of corporate welfare and see how many post offices can suddenly re-open. This past Sunday, I flew home to Los Angeles from Thanksgiving with my relatives in Montreal (actually, it was a bat mitzvah since Canadian Thanksgiving occurred six weeks ago but you get the idea).Â The Sunday after Thanksgiving is the busiest flying day of the year, with millions of passengers criss-crossing the country.Â And I had to connect through O’Hare, theÂ second busiest airport in the world.Â I was dreading the experience, and half-expected to be stranded in Chicago on Sunday night. And nothing happened.Â The flight into Chicago was fine; the flight out of Chicago was fine. And as far as I can tell, the same thing happened in thousands of flights all over the nation.Â Flights were generally on-time arriving and departing, despite rainy and cloudy weather conditions. Now, IÂ don’t knowÂ how this occurred.Â Airports runÂ by state and localÂ governments and regulated by the Federal Aviation Administration all coordinated tens of thousands, if not millions of different activities, events, and flights throughout the United States. But…but…weÂ all knowÂ that this just isn’t possible, because the government is invariably inefficient, incompetent, corrupt, slow, bureaucratic, and completely incapable of nimbly managing these millions of transactions and activities, unlike the private sector.Â Â (That’s why it’s so great that the Republicans want to cut the FAA’s budget).Â There is simply no way that any of this could have happened.Â Â I really have no idea how I got home from Montreal. So at this point I’m figuring that I must have dreamed up the whole thing. In an earlier post, I noted with approval the comments of Jonathan Chait, Keith Humphreys, and others who have been critical of Drew Westen’s claim that if President Obama had been more forceful in his use of narrative, he could have enacted a much greater proportion of the progressive agenda. Â But I went on to note that Westen had made an important point nonetheless. Given the composition of the House and Senate, Mr. Obama may not have been able to achieve substantially better legislative outcomes in the short run, but he could and should have forced Republican obstructionists to pay a much steeper political price. Â In this piece, I propose a bit of political theater that I hope the president will consider for that purpose. Taxation is one thing; voluntary contributions are something else. Is this so hard to understand? Warren Buffett’s recent NY Times op-ed advocating higher taxes on the wealthy (â€œStop Coddling the Super-Rich,â€ Aug. 15) provoked a response that was vacuous even by the Right’s recent standards. Â As Jack LeMenanger of Winchester, MA, wrote in his letter to the editor, for example, “If Warren E. Buffett wants to pay more in taxes, no one is stopping him.” Â Andrew Roth, VP of Government Affairs for the Club for Growth, agreed: “Nothing is stopping him from sending a larger check to the Internal Revenue Service as if higher tax rates applied to him.” Â But unless these authors can point to an example of a successful society that relies on voluntary tax payments, their objection makes no sense. Author Robert FrankPosted on August 22, 2011 August 28, 2011 Categories Everything ElseTags Infrastructure, Paying for nonrival goods, Republican Party, soaking the rich, Taxation, Warren Buffett30 Comments on Voluntary Taxation? Author Jonathan ZasloffPosted on April 28, 2011 Categories Energy & The EnvironmentTags Built Environment, Infrastructure, Republican Party, Transportation, Watching Conservatives20 Comments on Chris Christie: A Moron AND A Hypocrite! What Happened to Transit in the Stimulus? Smart Growth America’s state policy director offers an explanation. First, what data would one look at to make such a judgment? One place is US DOT, which tracks how long it takes federal money to be spent. In fact, road money moves out of FHWA faster than transit money moves out of FTA. But there’s no physical reason why that is so; it’s a purely political outcome of the last eight years, during which Bush sought to speed for road projects, and slow transit. I don’t know that those are the data the Obama crew are looking at, but there is a very clear concern in a number of programs about the ability of federal programs to move stimulus money, let alone states to actually spend it. Wouldn’t it be a shame if Bush-era disinterest in transit ends up knee-capping transit at the start of the Obama era? Second, transit can often act as a faster stimulus than roads. Transit ridership around the country has continued to rise despite moderating gas prices, yet transit agencies from coast to coast are announcing doomsday budgets of service cuts and fare hikes. The most shovel-ready project in the country is simply stopping those cuts and hikes. The buses are on the street, the people trained. You don’t need to buy any right of way or gravel; all money goes straight to wages for transit workers, and/or the pocketbooks of commuters. It saves people (riders) money immediately, multiplying the effect in a way that construction will not do soon (if ever, but that’s a longer argument). In doing so, it helps workers in many industries, not just construction and engineering. Finally, it’s stupid to build transit lines (there’s still some money for new transit in the Obey bill) at the same time you are driving riders away by gutting their service & raising their fares. So it’s especially troubling that while House Approps reduced most of the transit numbers from Oberstar’s proposal, it eliminated transit operating assistance altogether.